Using modern-day examples and biblical characters, Don Otis shows how small compromises can become larger ones, causing unwary Christians to fall in to sin. He offers practical biblical principles to help readers examine their motives and make sound moral choices. More and more Christians have bought into the moral standards of the world. As a result, they often rationalize questionable actions. In a readable, down-to-earth style, Otis explores this subtle self-deception, which he feels is the most underrated problem facing the church today. In fact, confronting sin in the church is a biblical mandate. Otis offers nine directives to follow and seven questions to ask.Using real-life examples as well as biblical characters, Otis shows how small compromises can become larger ones, causing unwary Christians to fall into sin. He offers practical biblical principles to help readers examine their motives and make sound moral choices. Only when Christians take responsibility for their own sin and turn toward obedience to God will the church be the example that God intends. 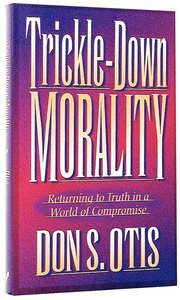 Compiler and contributing author Don Otis is the author of "Trickle-Down Morality" and "Teach Your Children Well." In his mid-forties, Don has competed in triathlons throughout the western U.S., run in dozens of road races over more than twenty years, and climbed mountains on three continents.